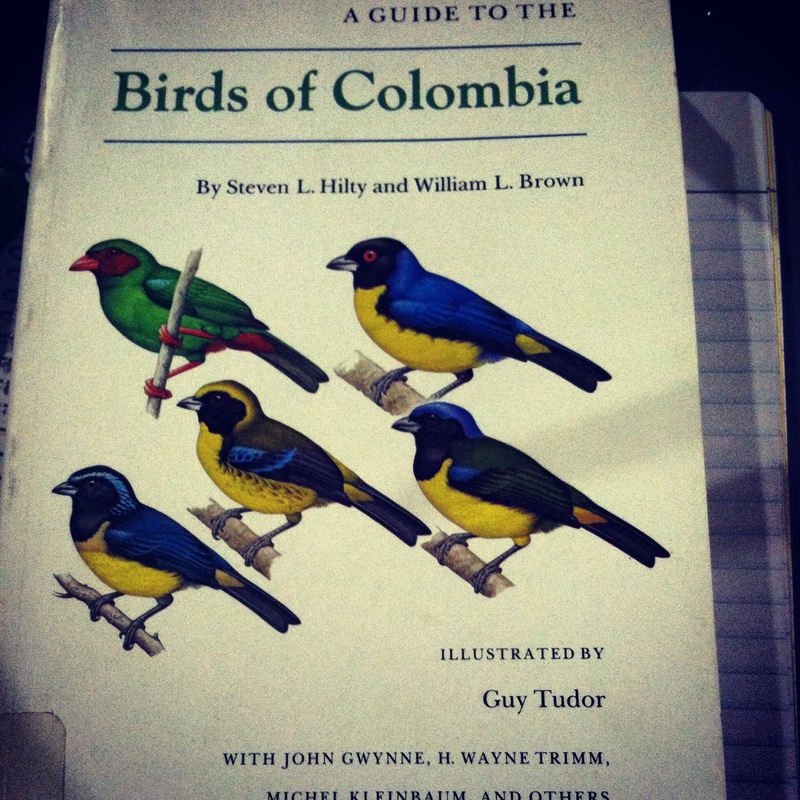 I’ve been thinking lately, that many of us don’t know that birds are truly the messengers of the natural world. When you think of a bird messenger, if you’re like me at least, then you think of a pharaoh from ancient times, in his robes made of the finest silks and gold, delicately placing the characters of an urgent message on a papyrus scroll, which he then rolls up to give to his falcon as it flies off into the distant desert sunset. Very Hollywood right? But in reality while historically there has been some “avian delivery,” the real message that they bring is more subtle and of greater importance. They are, in some cases, the sole indicator of the overall health of an ecosystem; a task that is so perfectly achieved by them. Everyone has heard of the ‘canaries in the mine’ reference, so it’s known that birds are greatly affect by there surroundings. With that being said, do you wonder how many researchers are looking at the responses that birds are having to the environment? Well many actually, I was lucky enough to be able to sit in on a Webninar hosted by Allison Vogt, Association of Fish and Wildlife Agencies and Ken Rosenburg, Cornell Lab of Ornithology where they went over the NABCI State of the Birds Report for 2014. For those of us who don’t know what the State of the Bird Report or the NABCI are, let me shed some light. The State of the Bird Report is one of 5 yearly reports that goes back to 2009, which uses data from citizen science groups like North American Breeding Bird Survey and the Audubon Christmas Bird Count to analyze the populations of birds in distinct ecological habitats as a way of understanding the trends of the populations in those habitats and the environments themselves. NABCI is a congregation of federal agencies, conservation organizations and others that together work to maintain happy and healthy bird life in North America; and thanks to all the hard work and collaboration we now have a “report card” as Allison put it, for how effective our conservation efforts are. There are people looking at the affects of our environmental manipulation on birds, and while many species are in decline there are still some hope. So I encourage you to read the report if you haven’t already, it isn’t technical, long or confusing; it’s main audience is policy makers and the general public. Learn about what habitat you belong to and the severity of the decline of species. Understand how appropriate governmental policies can bring about change for birds, the environment and yourself. Don’t let the messages that our feathery friends are sending go unread. As the start of summer officially begins (this Saturday, June 21st! ), I am reflecting on the past months of my internship here with Environment for the Americas along with the goals I have for the final stretch of my internship. The wrap up of our International Migratory Bird Day: Walk in the Wild event is giving us a lot of ideas and inspiration on how to make it even better and bigger for 2015. 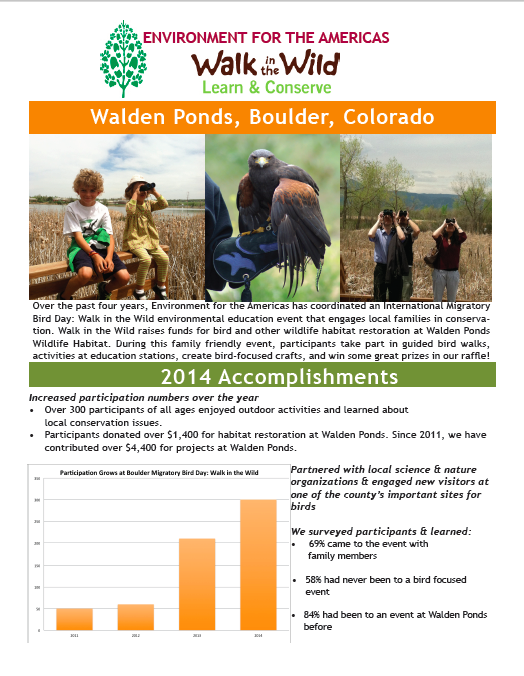 Overall, the final numbers are that we had over 300 participants and raised over $1,400 for habitat restoration at Walden Ponds! Upon the completion of the event, we sent a survey out to participants and there was a lot of interest in EFTA offering some summer Jr. Birder educational programs this summer! Our first Jr. Birder activity will be next Friday, June 27th at Sawhill Ponds with a nature walk hosted by City of Boulder Open Space & Mountain Parks and Americas Latino Eco Festival. (If you are unfamiliar with Americas Latino Eco Festival…check it out; it is largest Latino themed Environmental Festival in the world: http://americaslatinoecofestival.org/) After the nature hike, I will lead a bird-related activity from our Jr. Birder booklets…I hope we have some kids attend! There will be a total of 3 activities throughout the summer and I am really excited to get some more hands-on experience in leading activities with children. Stayed tuned for more updates of my sure-to-be-great summer here in the EFTA office! Onn Sunday the 18th we celebrated International Migratory Bird Day at the Elkhorn Slough National Estuarine Research Reserve. In preparation for the event Carlos and I were able to do some redecorating in the Visitor Center. We put up a lot of different pictures of birds on the wall; I tried picking pictures of birds that we see in the area so that visitors might be familiar with some of them. We also put up a big poster about migration, explaining what migration is and why certain animals migrate. For the IMBD event I also decided to make something fun: bird cutouts so people could put their faces on a bird’s body. The birds I decided to make were an American Avocet, Anna’s Hummingbird, and a Mallard because they are birds that are often seen at the Elkhorn Slough Reserve. Our supervisor Amanda A. also printed out information on “Why Birds Matter” and information about migratory birds in general that was available for visitors to take with them. For the event we had coloring for younger children and paper-bag Heron puppets for older children. That day we also had open lab so visitors could look at feathers and benthic invertebrates under the microscopes, which is something that is usually not available to the public but mostly to school groups. The people who I observed at the lab seemed to really enjoy and seemed to be fascinated by what they saw under the microscope. Overall it was a good event. It was a preview of what it would be like to give walks all of the time. I feel like I still have a lot of information to learn about the reserve so I can adequately answers questions from visitors.